The next three photos are of the Cold Harbor National Cemetery. Established in April 1866, the Cold Harbor National Cemetery contains the remains of Union soldiers who died in the battles of Beaver Dam Creek (1862), Gaines' Mill (1862), Savage's Station (1862) and Cold Harbor (1864). Of the 1,952 Civil War burials here, only 673 were identified. Dedicated in 1909, this monument to the 8th New York Heavy Artillery stands in the Cold Harbor Cemetery. This regiment lost 505 men at Cold Harbor, the highest number casualties for any Union regiment in the battle. The monument bears the names of 137 men of the regiment who were either killed at Cold Harbor or died of their wounds afterward. The Garthright House is located across Old Cold Harbor Road from the National Cemetery. During the Civil War, it was the home of Miles Garthright and his family. During the Battle of Cold Harbor, the family huddled in the basement while the Union army used the house as a hospital. Located five miles behind the Union lines at Cold Harbor, the Old Church Hotel served as headquarters for cavalry commander Major General Philip H. Sheridan. 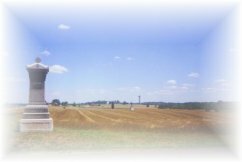 This monument was erected to members of the 36th Wisconsin Infantry who were captured on June 1, 1864 at Cold Harbor. The regiment's commander, Colonel Frank Haskell, who is famous for his writings about the repulse of Pickett's Charge at Gettysburg, was killed two days later. The monument was paid for and erected by Charles Storke who was a member of the regiment and captured at Cold Harbor. On May 28, 1864 Enon Methodist Church marked the confederate line of battle in the cavalry engagement known as Haw's Shop. After crossing the Pamunkey River, Union cavalry clashed with southern troopers here in an attempt to open the roads for Grant and Meade. Portions of the church are original with additions having been built in the years after the war. The Battle of Haw's Shop was one of the largest cavalry battles fought in Virginia. Union cavalry under Brigadier General David McM. Gregg fought the entire afternoon against Confederates under Major General Wade Hampton. A late afternoon attack by George A. Custer's brigade broke the southern line. Nearly 10,000 cavalrymen were involved at Haw's Shop and casualties amounted to almost 700. This small monument stands just east of Enon Church. It was dedicated to the 27 unknown Confederate cavalrymen buried in the churchyard. The field behind the monument was the scene of some of the heaviest of the fighting here on May 28. Situated on the bluffs overlooking the Pamunkey River is "Wyoming," the wartime home of the Nelson family. On the morning of May 28, 1864 the Union Sixth and Second Corps passed the house on their way to the pontoon bridges at Nelson's Crossing. All captions on this page were written by Eric Mink.